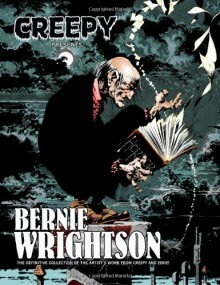 All of horror legend Bernie Wrightson's Creepy and Eerie short stories, color illustrations, and frontispieces are finally collected in one deluxe hardcover! These classic tales from the 1970s and early 1980s include collaborations with fellow superstars and Warren Publishing alumni Bruce Jones, Carmine Infantino, Howard Chaykin, and others, as well as several adaptations and original stories written and drawn by Wrightson during one of the most fruitful periods of his career! All stories and images in this collection are restored with care and reprinted in the same oversized format as Dark Horse's award-winning Creepy Archives and Eerie Archives series. Brilliant example of a master's work. If you read only one book to get a feel for how good Creepy was, both in terms of story-lines and artwork, this would be a front running candidate. "Jenifer" may well be the creepiest horror comic story that I have ever read.